What We Know About The Las Vegas Strip Shooter : The Two-Way Neighbors of Stephen Paddock, who authorities say killed scores of people at a concert on the Las Vegas Strip, say he and his girlfriend stayed up nights playing online poker. Stephen Craig Paddock, the 64-year-old white man who police say carried out the worst mass shooting in modern U.S. history Sunday night on the Las Vegas Strip moved frequently, buying and selling property in several states. But the twice-divorced retiree had one vein that seems to run through the middle of his itinerant lifestyle — a love of gambling. Police say that on Sunday night, Paddock broke out windows in a 32nd-story hotel room at the Mandalay Bay Resort and Casino and pulled the trigger, raining a hail of gunfire on concertgoers at the Route 91 Harvest country music festival across the street. Witnesses described what followed as "nonstop gunfire" that sent people fleeing for their lives. At least 59 people were killed and more than 500 injured. Las Vegas Sheriff Joseph Lombardo said shooter, described by authorities as a "lone wolf," checked into his room at the Mandalay on Thursday, but that police did not know what he had been doing in the days leading up to the shooting. Lombardo called Paddock "a psychopath." But in a news conference on Tuesday, Lombardo said authorities still did not have a motive for the shooting. Paddock's brother, Eric seemed to rule out any ideological motive for his brother's actions. Asked if Stephen had been agitated about politics, he replied: "No religious affiliation. No political affiliation. He just hung out." He did say that his brother liked to play high-stakes video poker. "He was a guy. He gambled," Eric, who lives in Orlando, Fla., told reporters Monday. Although Stephen Paddock had lived for several years in California and briefly in Florida, in recent years, Paddock seemed to gravitate to Nevada — specifically the gambling cities Las Vegas and Reno, which is where he may have met Marilou Danley, the woman described by authorities as his companion. His last address was in Mesquite, about 90 miles from Las Vegas. He had another home in Reno, where Danley had worked as a "high-limit hostess" in the Atlantis Casino Resort and Spa, the casino said in a statement. Although Atlantis did not confirm the dates of her employment — reportedly from 2010 to 2013 — it did say she had left the job "several years ago." Records show that a few years after moving into Paddock's condominium in Reno, Danley, an Australian citizen with family in the Philippines, divorced her husband of 25 years. Paddock sold the condo unit in Dec. 2016. Public records for Paddock show his first marriage was in 1977. He divorced in 1980. He married again in 1985 and was divorced from his second wife just five years later. In 2013, Paddock bought a newly built property in Melbourne, Fla. NPR's Pam Fessler spoke to a neighbor there, Sharon Judy, who lived next door. 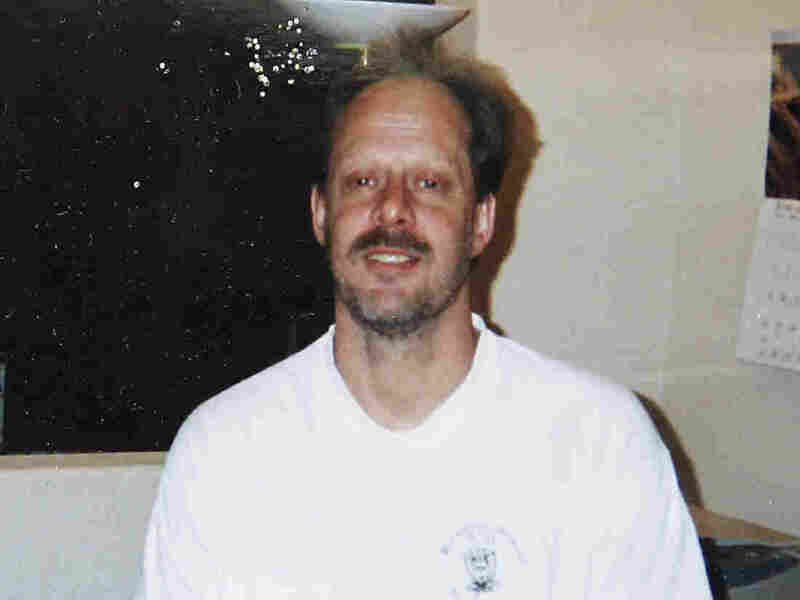 Paddock told Judy that he bought the house for speculation and that "he wouldn't be living there, but he would come and visit." She described him as friendly and said he gave her a key to the house so she could check in occasionally. "He was very open with us that he bought the house for speculation, that he bought other homes for speculation," Judy tells NPR. He also told her, "he was a professional gambler, he and Marilou both, and that's what they did. They traveled around, they gambled, they speculated on property." Judy said the couple would stay at the house for a few days at a time and then leave. Paddock "never talked politics or religion," she said. The couple told her that they gambled online and when they were at the house, they didn't wake until noon or 1 p.m., "because they were up all night gambling." One other detail: "They would both talk about how they would go back to the Philippines and visit [her] family," Judy says. NBC News says that Paddock wired $100,000 to the Philippines last week, but NPR has not independently verified that report. NBC says that Danley traveled to the Philippines on Sept. 25 via Hong Kong. Separately, USA Today reports that authorities were looking into "recent transfers of large amounts of money involving the suspect and the possible relationship to gambling activities." Lombardo on Tuesday confirmed that Danley was in the Philippines and said she is currently considered "a person of interest." He said he did not know about the reported wire transfer. Eric Paddock, who spoke with Amy Green from member station WMFE, said he doesn't think Danley will be able to provide much information about his brother's mental state in the lead up to the attack. He said he thinks his brother probably "bubbled her from this completely." In a story published Monday, Eric told The Orlando Sentinel, that his brother had "never even drawn his gun before." He told CNN that Paddock owned "a couple of handguns." But that picture was at odds with what police found in the shooter's hotel room and residence: "We have recovered 23 firearms at Mandalay Bay, and 19 firearms at his home in Mesquite [Nv. ]," Las Vegas Assistant Sheriff Todd Fasulo said. As NPR's Richard Gonzales reports: "the office of Rep. Adam Schiff, (D-Calif.) said that he had been briefed by the FBI and informed that some, but not all of the weapons found in the hotel room were fully automatic. It was not clear whether those weapons were manufactured as fully automatic or whether Paddock had converted them." In the news conference on Tuesday, Lombardo said he could not say if any of the weapons were automatic, but "we are aware of a device known as a 'bump stock'" that allows a user to increase the fire rate of a semi-automatic weapon. Two Nevada gun shops confirmed that the shooter had bought weapons from them, apparently in the past year. One of the shops, Guns and Guitars in Mesquite, issued a statement saying that "all necessary background checks and procedures were followed." Mesquite lies near the border with Arizona and Utah. Chris Michel, the owner of another gun shop in St. George, Utah, met and spoke with Paddock three times earlier this year. Speaking to NPR's Howard Berkes, Michel says that the number of weapons Paddock owned was not all that unusual. "I have customers that have hundreds of guns," he says. Sheriff Lombardo said Monday that Paddock might have had a traffic citation — but had no criminal history in the state and that there were no immediate indications of such a history elsewhere. Lombardo said several pounds of ammonium nitrate, a chemical compound used in bomb-making, was found in Paddock's car. On Tuesday, the sheriff said "numerous electronics, two handguns, five shot guns and a plethora of ammunition" were found at Paddock's Reno residence. He said the shooter had installed cameras outside and inside the room, apparently to monitor for the approach of authorities. "I don't know the specific numbers," he said. For years, Paddock held a private pilot's license. He had owned two different single-engine airplanes, selling the last more than a decade ago. Records show he allowed his license to expire in 2010. He also had a hunting and fishing license for Alaska. Paddock's family also apparently has a dark past: Eric Paddock said his father held up multiple banks, broke out of prison and spent several years on the FBI's most wanted list. Speaking in an interview with CNN, he said sarcastically: "We're all proud. My father was on the Top 10 list for a while." NPR has not independently confirmed that Benjamin Hoskins Paddock, the man from the Most Wanted poster, is the father of Stephen and Eric Paddock. A report in The Chicago Tribune from June 1969 states that a Benjamin Hoskins Paddock, then 42, was being added to the "10 most wanted men" list. It said the suspect had "once tried to run down an FBI agent with his car" and that Paddock, "known as 'Chrome Dome' in underworld circles because of his practice of shaving his head, has been diagnosed as a 'psychopath.' "
Eric Paddock said of his father: "I didn't know him; we didn't know him. He was in jail," adding that his father had "broken out of jail." FBI Las Vegas Special Agent in Charge Aaron Rouse said at a news conference that the bureau has "determined, to this point, no connection with an international terrorist group." He was responding to reports that Paddock had recently converted to Islam and that the terrorist group Islamic State had claimed responsibility for the Las Vegas Strip attack. A Las Vegas Metropolitan Police Department undersheriff called the attack an act of "domestic terrorism."